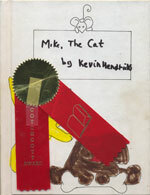 In 1986 while in first grade I wrote and illustrated the “Scotchcott” award-winning children’s book Mike, The Cat. It tells the thrilling story of how Mike the cat woke up the entire family so they wouldn’t be late for work or school. What a hero, that Mike. Mike was fashioned after my own cat, Skeeter. The comma in the title is awesome. The illustrations were modeled after my house and my family (though it appears I wrote my brother out of the story—sorry Rick). Every human character in the story appears to be bald. Even the mom character. The original print run was a single copy. I had little choice on the book cover, but do remember having to choose the cat and dog or trucks. I chose the cat and dog, though no dog appears in the story (a truck does actually appear in the story—it’s the very back end of the vehicle that can be seen driving off the last page). 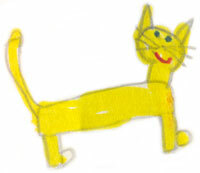 I hope you enjoy Mike, The Cat in all its terrible glory.